Thank you for taking part in the Top Notch Car Show 2018! Thanks to you, we all had a great weekend. We are ourselves owners of classic cars, and know the work involved in going to a car show. Thank you for putting so much energy and taking the time to participate. Many things happened over the weekend, at this beautiful event of October 6th & 7th, 2018 at Top Notch. From the moment you came in, our photographers captured as many moments as possible. We will make a compilation of all these moments in a souvenir book that you can get for $20.00. In this book we will also include a page exclusively for the assessment of this day, to inform you of all donations to benefit Rosemary Clarke Middle School and Nye Communities Coalition, and other informations related to the fund raiser. 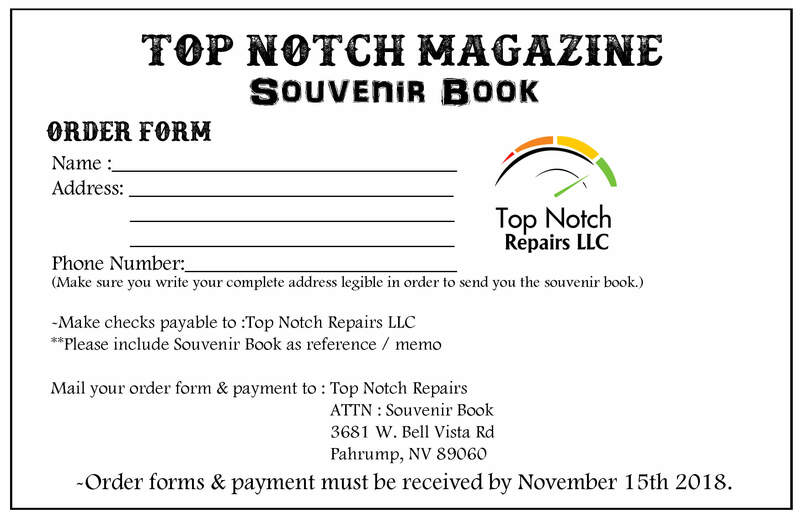 To order the souvenir book you can fill in the online form below. 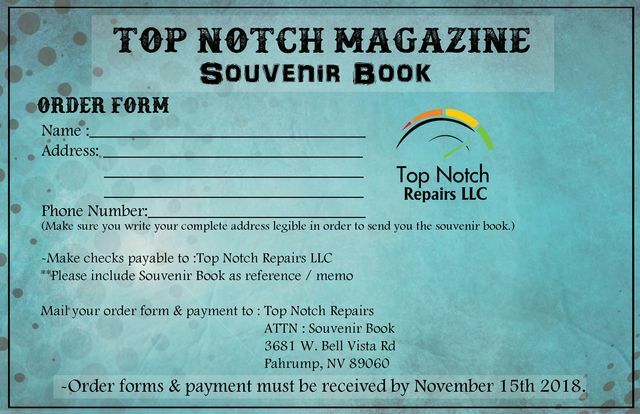 you can also print the form, available further down this page, and bring it over with your payment, or mail it. If you have any question, you can always give us a call at 775-751-1007. NOTE TO EVERYONE: The registration form below might not work properly using the stock browser on Android devices. if you are not using the stock browser on Android, you can disregard this message. Please use another browser like Mozilla FireFox or Google Chrome. We apologize for the inconveniences. After submitting your form, you will receive a confirmation on your email address. Please use a valid email address. If you don't receive it within 24 hours, please contact us.